A complete basic set of poker chips used in private poker games or other gambling games is usually comprised of white, red, blue, green, and black chips. Larger, high-stakes tournaments may use chipsets with many more colors. When playing Texas Hold 'Em Poker, Omaha Hold 'Em Poker, or any game that involves chips as currency, it's vital to know what each chip is worth. While there is no official "rule" for how chip values are assigned, there are common standards used for most poker events. 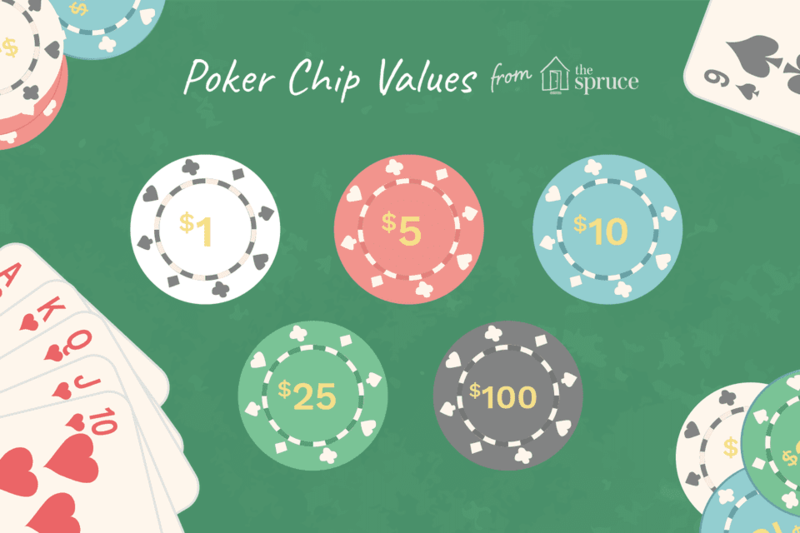 Whatever value system you use, make sure all your participants understand the denominations and values of each type of chip. A good way to do this is to write down and post the denominations so that everyone can see them. Marking the chips themselves by writing the denominations on them is generally discouraged. There are some variations to these denominations (e.g. green is occasionally played as $20). If you are hosting a poker event with up to 10 players, experts suggest that you have about 500 chips in three or four basic colors. In the event that you are hosting a larger game involving up to 30 people, a collection of 1,000 chips in four or five colors is recommended. If you are putting together a set of chips to run your own games, it's recommended that you keep the number of different colors fairly low, and assemble your collection so that you have the most chips in the lowest denomination, with progressively smaller numbers of chips as the denominations climb. For example, if you are assembling a set of four chip values of $1, $5, $10, and $25, the number of chips by ratio should be 4:3:2:1. For a set of 500 poker chips, for example, you should have 200, 150, 100, and 50 chips in white, red, blue and green, respectively. Casinos usually have custom-designed chips with the monetary value and the name of the casino printed or engraved on the face. The chips may be multi-colored and stylized with patterns. The color-coding may follow the values noted above, or individual casinos may have their own unique color coding systems. Atlanta casinos: Most casinos follow the basic primary color-coding values for white, pink, red, green, and black chips, with the addition of yellow chips at $20, and blue chips valued at $10. Las Vegas: These casinos also follow the basic primary color coding but also add $20 chips. The poker room at the Wynn casino also includes brown chips valued at $2 and peach chips valued at $3. $1: usually blue but can vary. Chip values above $5,000 are rare by the public in casinos, since such high-stake games generally are held out of the public view. For very high-stakes games, casinos may use rectangular plaques that are about the size of a playing card. In casinos where high-stakes gambling is allowed in public areas, there may be plaques in denominations of $5,000, $10,000, $25,000, and higher. These casinos are generally found only in Nevada and Atlantic City. Gambling games through history have always made use of some form of marker to represent cash or other forms of currency, but forms of standardize betting chips of the type we now know came into use during the early 1800s, when saloons and gaming houses in the West began making use of engraved pieces of bone, ivory, or clay as chips in their house-run games. These early chips were easy to copy, though, so by the 1880s commercial companies were beginning to manufacturer customized clay chips for saloons and gaming houses by commissioned order. These chips were carefully stylized to make them particular to a given customer, and therefore hard to forge. In modern casinos, the chips are custom designed and manufactured, and many still contain a large percentage of clay in their composite material. Some casinos use ceramic chips. Weight, texture, design, and color are very carefully controlled, making them harder to counterfeit than paper currency. Some casinos even embed their gambling markers with microchips, making them virtually impossible to copy.